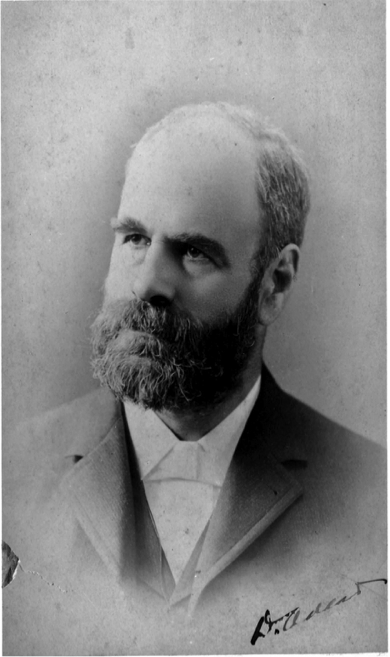 Ferdinand Wythe Peck (1848-1924) was born in Chicago to one of the city’s wealthiest and most influential families. Ferdinand’s father, Philip Ferdinand Wheeler Peck, was among the first settlers in Chicago, back when it was still known as Fort Dearborn. Philip Peck began as a commission merchant, but made his fortune in real estate. Philip married Mary Kent Wythe in 1835, and together they raised three sons. Ferdinand was born at his family’s home on Jackson Boulevard between Clark and LaSalle Streets. The family later moved to 203 South Michigan Avenue (on the same block where the Auditorium Building was later built), where the they lived until the Great Chicago Fire destroyed the area. Philip Peck died in 1871 from an injury obtained during the Great Fire, leaving his fortune to Ferdinand and his two older brothers. By the time the Auditorium Building opened in 1889, the Philip Peck Estate was the fourth largest private fortune in Chicago. Peck was educated at the University of Chicago, studied law at the Union College of Law, and was admitted to the bar in 1869. He was a founding member of the Illinois Humane Society, which was dedicated to the prevention of cruelty to children and animals, and served on the city’s Board of Education. Peck was also a strong supporter of artistic and cultural events. He organized the Chicago Grand Opera Festival in 1885, where he worked with Dankmar Adler and Louis Sullivan for the first time. Peck was dedicated to improving the city of Chicago. After the Haymarket Square riot in 1886, he began plans for the Auditorium Building. He incorporated the Chicago Auditorium Association in December 1886 to develop what he envisioned as the world’s largest, grandest, and most expensive theatre. Peck dreamed of creating a venue that embodied the democratic ideals that he believed in, bringing art to all of the people of Chicago. The renowned firm of Adler and Sullivan was hired to design the Auditorium Building project. Peck was later named the First Vice President of the World’s Columbian Exposition. The Auditorium Theatre was designed by the famous architectural team of Adler and Sullivan. The Auditorium is the combined success of Dankmar Adler’s acoustic and engineering innovation and Louis Sullivan’s architectural and design brilliance. Dankmar Adler (1844-1900) was born in a small town in Germany. After his mother died in childbirth, his father named him Dankmar which is a combination of the German words dank (thanks) and mar (bitter). Adler moved with his father to Detroit, Michigan, where his father became the rabbi of Congregation Beth-el. He did not finish his formal education but instead chose to become a draftsman in the office of Detroit architect E. Willard Smith. At the age of 18, Adler enlisted in Company M, First Regiment, of the Illinois Light Artillery to fight in the Civil War and served in the Chattanooga and Atlanta campaigns. He spent the last portion of his service in the Engineer’s Office, receiving training in architecture and engineering. When he was discharged, Adler returned to Chicago and joined architect Edward Burling in designing churches, schools, and courthouses. The 1871 Great Chicago Fire caused a building boom, and the commissions Burling and Adler received quickly grew to include offices and large public buildings. In 1872, Adler married Dila Kohn, the daughter of Abraham Kohn, founder of the Kehilath Anshe Ma’ariv Synagogue, where Adler’s father was the rabbi. In 1879, Adler decided to leave the partnership with Burling and open his own firm. He asked young designer Louis Sullivan to join his firm, and soon after, they became partners. In 1886, Adler and Sullivan were commissioned by Ferdinand Peck and the Chicago Auditorium Association to design the Auditorium Building. 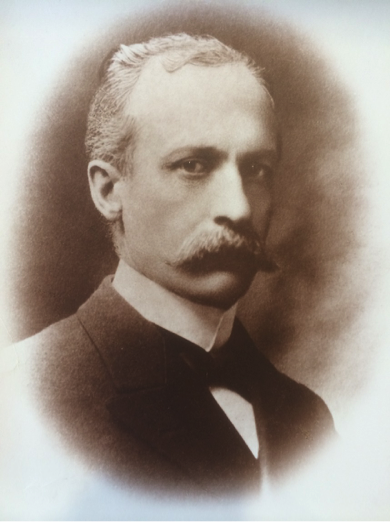 After nearly 20 years of partnership with Sullivan, Adler left the firm in 1895. Five years later, he died from a stroke at the age of 56. Dankmar Adler was known as a great structural engineer and acoustic genius. 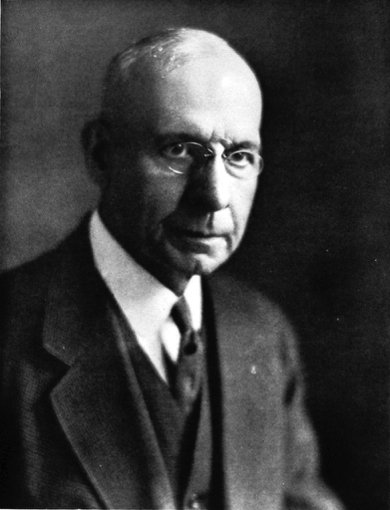 Louis Sullivan (1856–1924) was born in Boston, Massachusetts, the son of a dance instructor and a musician. During his early adult years, he studied architecture at the Massachusetts Institute of Technology and worked as a draftsman with the renowned Philadelphia firm Furness and Hewitt. Following the Great Chicago Fire of 1871, Sullivan moved to Chicago to take part in the building boom. He spent his first year in Chicago working for William Le Baron Jenney, the architect who is credited with designing the first skyscraper. Sullivan then studied for a year in Paris at the prestigious École des Beaux-Arts. He returned to Chicago and became a draftsman for John Edelman, who introduced him to Dankmar Adler, who hired Sullivan in 1879. In 1879, Sullivan was hired by architect and engineer Dankmar Adler. 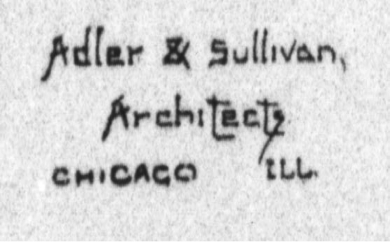 A few years later, Sullivan and Adler became partners. Their firm began work on the Auditorium Building in 1886, when Sullivan was just 30 years old. Louis Sullivan’s Golden Doorway (Transportation Building) broke with the neoclassic standards of the White City. Image Courtesy of Inecom Entertainment Company. In 1890, Sullivan was one of ten architects chosen to design a major structure for the “White City,” the World’s Columbian Exposition, held in Chicago in 1893. 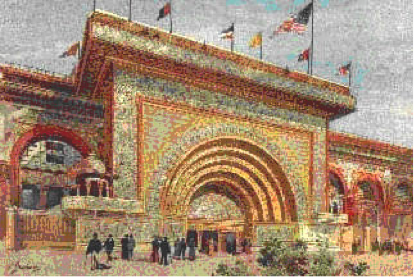 The result was the colorful Transportation Building with an arched “Golden Door.” The building was often criticized by Americans as it was the only multicolored facade in the White City. Outside the United States, however, Sullivan’s Transportation Building was the only building at the 1893 World’s Fair to receive extensive recognition, receiving awards from the Union Centrale des Artes Decoratifs. After Adler left the firm in 1895, Sullivan continued to design buildings, including Chicago’s State Street Carson Pirie Scott department store, the Gage Building, the Bayard Building in New York, Holy Trinity Russian Orthodox Church, and the Krause Music Store, among others. Dankmar Adler invited Louis Sullivan to join his firm in 1879 and made him a partner in 1883. Adler and Sullivan’s 15-year architectural partnership produced some of the most important structures in the history of American architecture. The two architects complemented each other perfectly: Adler was recognized as an outstanding acoustical and structural engineer, while Sullivan was famous for his design and ornament. The result was a very successful firm known for creating original structures that evolved from the functional requirements of each project, pushed the limits of the most modern technologies, and included innovative – and often ornamental – design. Adler and Sullivan initially designed primarily residences and small commercial buildings, including the Ryerson and Troescher, Eliel House, Jewelers’ Building, and Kaufmann Store and Flats. In 1886, less than five years after the formal partnership began, Adler and Sullivan began work on the Auditorium Building. Frank Lloyd Wright was hired as a young draftsman by the firm in 1888. By late 1880s, the firm of Adler and Sullivan was designing large structures such as the Stock Exchange, Schiller Theater, the Wainwright in St. Louis, Mo., and the Guaranty buildings in Buffalo, N.Y. The firm of Adler and Sullivan designed approximately 180 buildings, of which the crowning achievement is widely considered to be the Auditorium Building.